The 14t Dalai Lama /ˌdæl.aɪˈlɑː.mə/ (releegious name: Tenzin Gyatso, shortened from Jetsun Jamphel Ngawang Lobsang Yeshe Tenzin Gyatso, born Lhamo Dondrub,[lower-alpha 1] 6 Julie 1935) is the current Dalai Lama an is the langest-lived incumbent. 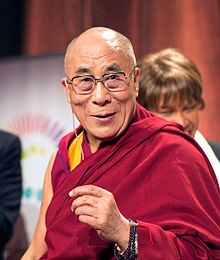 Wikimedia Commons haes media relatit tae Tenzin Gyatso, 14th Dalai Lama. This page wis last eeditit on 6 Mey 2018, at 17:42.